NC State researchers have created fashionable clothing that can be used for exercise as well as capturing vital body measurements. In 2017, an estimated 1.66 billion people worldwide purchased goods online. During the same year, between 20 and 50 percent of online clothing sales were returned — a majority because of poor fit (Cheng, 2015; Pulga, 2015). Researchers at the Wilson College of Textiles at NC State University, Raleigh, N.C., have developed a solution to the waste and cost of these returns: Prime Fit is a proprietary mobile app and garment system that offers an inexpensive way for consumers to obtain accurate body measurements in the privacy of their own home (patent number US2018/046248). The system could be revolutionary for online shoppers, e-commerce clothing companies and even fitness and wellness applications. The mobile app, in development at NC State, obtains measurements from 2D images that have been taken with a cell phone or digital camera while the user wears a special Prime Fit measuring garment. The software gathers basic demographic information, such as age, height, weight, gender and ethnicity, as well as front and side pictures of the body while wearing the measurement garment. The output results in 2D measurements that will provide accurate dimensions that can help consumers identify their “size” for clothing purchase. Most of the sizing that is available for a product online is quite simplistic and usually includes bust, waist, hip, inseam length, and potentially back length. These measurements define the size and shape of the consumers bodies, rather than the measurement of the garment at the specific location. On the other side, most consumers do NOT know their own body measurements in order to determine the correct size. What is especially frustrating to consumers is that sizing often changes according to manufacturer and sometime country of origin. A consumer may think that they wear a size 6 in jeans, but find that in the more expensive products they can actually wear a size 4 and in a product from mass retailers, they might actually need an 8. The products may all be created with the same group of measures for the bodies that they are made for, but just identified as different size numbers. This is where the term “vanity sizing” comes from. What is really important is the combination of measurements used to determine the size connotation — 2, 4, 6 or S, M, L — rather than the size itself. Most products sold at retail in brick-and-mortar stores have no background measurement information available to define the sizes. The consumer just has to try on many pairs to figure out which fits best. And when they run out of time, patience, or will power, they select the best of the worst. For online sales, consumers actually need to find the sizing chart that relates to the product to try to figure out the most correct size. When they find the sizing system, they will find a group of bust, waist, hip, and inseam measurements the manufacturer used to define a specific size. Unfortunately, since much of the product sold online has been designed and assigned a size in China, the sizing is actually relative to the smaller Chinese body. The normal size medium consumer may actually have measurements that define an extra-large product that was created in China. This difference is really difficult to believe, so consumers often buy their regular size and then a second garment one size larger. This means they planned to return one garment anyway, and then often have to return the other as well because they didn’t have their own correct body measurements to start with. NC State researchers wanted to find a way to make it easy and fun for people to monitor their body measurements using a simple system that provides very accurate results. All consumers have body changes that occur over time that they may be totally unaware of. These changes can have a significant impact on the size of clothing needed. While some garments might not be impacted by small body changes — like T-shirts, for example — there are many other situations where personalized fit is highly desirable — such as for wedding gowns, tailored suits, evening wear and jeans. There clearly is a need for a garment system that could be used by customers to measure themselves accurately, easily, and cost- effectively and track this data. Researchers have been working to develop better ways to collect body measurements for decades. Traditionally, measurements have been collected manually using tape measures, anthropometers, and calipers. Unfortunately, the average person is really bad at taking their own body measurements. It is also very time consuming. A more accurate and speedy method of measuring bodies is by using 3D whole-body scanners. While this technology is quite amazing with the wealth of information that it can provide, it is fairly expensive and not widely available to most apparel shoppers. In addition, the technology requires the user to be scanned in their underwear in order to obtain the most accurate measurements. Many consumers are uncomfortable with the idea of images being captured of them in their underwear and do not want pictures of themselves circulating on the internet. They especially don’t want pictures of their children out on the web. New developments with handheld scanners have brought interest in their potential for use in measuring bodies, however, these scanners also can only measure what they “see” and must compensate for the clothing being worn. The garments worn during scanning affect the measurement outcome in significant ways. Technology is central to how millennials and the new I Generation — born since 1995 — operate in the world. Digital devices control their world and are their primary means of communication, almost entirely online, using their phones for everything. Retailers have also become more focused on the surge in mobile transactions. Since almost everyone has a cellphone that they use all of the time, using a cellphone as the body measurement device is convenient. However, since the RGB camera on a cellphone is no better at seeing through clothing than any other device in the marketplace, the reliability of the result depends heavily on the garment worn by the user. So, NC State researchers designed a garment that could aid in measurement extraction, provide appropriate privacy, and be something a user might actually want to wear to work out. Recently, 2D images — photographs — have become more popular as a means for obtaining body information because the method is low cost, pictures can provide reasonable results and image analyzing application programming interfaces (APIs) have become more powerful and accessible. The cellphone cameras can’t obtain as much information as the 3D whole body scanners when only a few images are taken. However, the information collected from these 2D images can be used to determine unknown information using statistical prediction models and machine learning. These opportunities have yet to be fully commercialized. There are many limiting factures when using 2D images for body measurements. One of the limitations is the surrounding space that is difficult to subtract out and away from the image of the body. Privacy remains a concern, as well. To help solve these issues, garment apparatuses have been designed and tested. These apparatuses can protect a customer’s privacy and make it easier to identify body measurements and the appropriate locations. With 2D images taken using a garment apparatus, data mining and image processing techniques are much easier. This body measurement system can be used by customers to monitor their own measurements. User interviews and support statements suggest that it would be valuable and feasible to develop a body measuring system that customers could use whenever and wherever they want to get more accurate body measurements than they would be likely to obtain using a measuring tape on their own. Figure 1a: A schematic showing the body measurement system. NC State’s research focused on creating a fast, personal apparatus; system; and method for obtaining body dimensions extracted from 2D images captured by a user. Subjects wore the garment apparatus while having a 2D picture taken from the front and the side of the body. Computer vision technology was used to extract key body dimensions at primary locations based on the design of the garment. These dimensions were further used to predict additional body information. 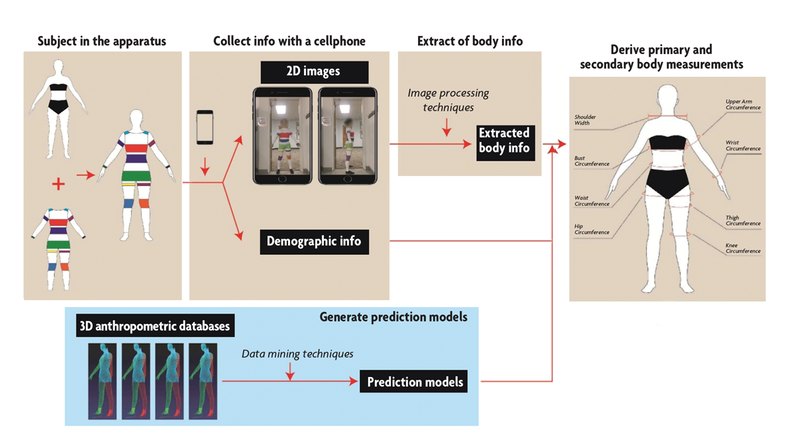 A huge, 3D anthropometric body database was used to train the prediction models using machine-learning algorithms. A schematic of the system is illustrated in Figure 1a. A prototype of the apparatus is shown in Figure 1b. Prototype of the apparatus designed by the NC State research team. The primary purpose of measurement system was to develop a way to obtain measurements that are accurate within the tolerance generally acceptable for clothing sizing while making the garment both practical and aesthetically pleasing. The garments have been designed with markings at specific locations to align with characteristic body features and coded with different colors so the measurement system can recognize where to measure from the 2D images. Camouflage patterns are applied in each color block to make the design less monotonous while ensuring the accuracy of measurements. The garments that have been developed can be kept, shared, returned or even worn as regular sports clothing. In e-retail, these garments can be shipped in the same box as a regular order. They can be used by a friend or family member and for all ages and populations with slight adjustments in size ranges. Once the garment pictures are taken, the consumer can use the data to shop for clothing at any website. If willing, the consumer can share with retailers to aid in better selection for future purposes. no need for specialized facilities or expensive equipment, such as 3D scanners, to take body measurements. 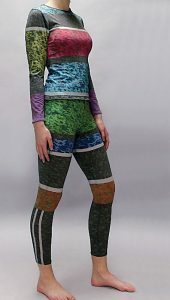 The garments are made using a 83-percent polyester/17-percent elastane four-way stretch fabric and the patterns are printed using digital printing technology. These garments are not only essential to the success of the software, they also can be used for active apparel. The measurement system developed at NC State is an efficient and cost-effective way to measure a body. Because most clothing shoppers have access to cellphones that can take pictures, it costs almost nothing for them to use the system. In an optimal situation, most of the cost could be borne by the garment manufacturers with the end result increased sales and substantially fewer returns because of fit issues. Most smart phones have internet access, which offers further opportunities regarding using the body information. Customers can access their up-to-date body measurements at anytime and anywhere. The body measurements collected through the system could be used to select garment sizes, create online 3D avatars, customize clothing patterns, and track customer’s fitness. The new system solves issues related to existing systems such as the high cost of 3D whole-body scanning technology, the measurement extraction dilemma of handheld scanners, and the low-quality results from manual measuring techniques. Overall, the developed body measuring system is innovative and important for the apparel industry, but also has the potential for the health industry.